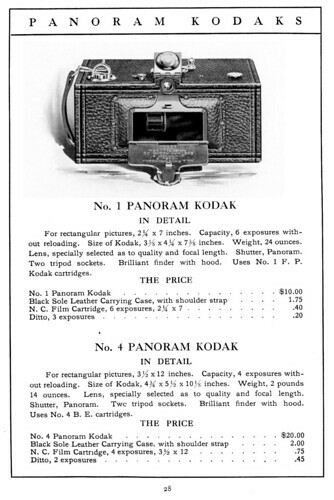 The Panoram cameras were a range of swing-lens Panoramic cameras made in Rochester, New York, USA by Eastman Kodak between 1899-1928. The design was patented by Kodak Brownie designer Frank A. Brownell. The Panorams had a swinging lens in a leather tube; and they had pronounced curves to the film plane, to match the movement of the lens. The swinging mechanism formed the shutter; the lens tube did not point at the film at either end of its travel, but exposed the length of the frame progressively as it turned to cover the angle of the shot. Each, except the original No.4, has a fold-down door covering the lens when not in use. A small brilliant finder was mounted centrally on the top-front edge - some with a cover providing a mirror for eye-level use, supplemented by V-shaped sighting-lines across the top of the camera. The viewfinders were also equipped with spirit levels. US Patent 693583: Shutter for Photographic Cameras - granted 18 Feb 1902 to Frank A. Brownell; the patent for the Panoram's shutter. Drawings show the internal structure of the camera.